With something like 500-600 retractions per year, and a constant flurry of publishing news to keep up with, our small staff stays busy – and can’t always immediately post on every new retraction that we discover. We’ve created this page to show you some of what’s on our current to-do list. If you have any tips for us about the nature of a retraction, expression of concern, or correction you see here — or know of any other retractions by the same authors — please let us know in a comment. Note: Once we’ve posted about a retraction, we’ll bump it down to the bottom of the list. Good idea. Let us, your readers, know when you see something on your radar that you don’t have time to do a full post on– then we can tell you early on what we know or suspect… like a distant early warning system, only more fun. I also explain why I didn’t want to pursue it…but that was then. Things are getting worse. The field of nutrition is surely the most fertile for your work. The authors denied wrongdoing. They requested a partial retraction of Study #3 however on the grounds of unspecified “coding errors” in the dataset. The editor of Marketing Matters decided to retract the whole paper, however. My blog post with links & my additional analysis of the problematic data is here. The case is related to the social psychology replication crisis because the paper was about a form of social priming, aka ‘money priming’. Will you accept suggestions for bad puns to use in the post titles? Dear Doktor, there are no bad puns. I hope this is not just a parody comment, designed to embarrass a predatory publisher! PS: Please do not show my email. Here is a link to a correction of a major political science paper “http://onlinelibrary.wiley.com/doi/10.1111/ajps.12216/full” for making a error in the data meaning. What’s going on with this paper about sugar? How long does it take to correct the record? And if it is not going to be corrected by the authors, should it be retracted? I did note that the retractions for Park and Choung (17 and 10,) have been discussed at RW in the past. Let them eat bacon? What’s the best article you’ve read evaluating in depth that 2014 Chowdhury meta-analysis allegedly exonerating saturated fats? Thanks to Retraction Watch for tipping us off to all the critiques, including from Harvard’s School of Public Health. Reported here: http://ria.ru/science/20160510/1430323610.html (Russian; translation: https://z5h64q92x9.net/proxy_u/ru-en.ru/ria.ru/science/20160510/1430323610.html) that the international group led by Prof. Igor Abrikosov found a mistake in the calculations. This mistake is acknowledged in the retraction notice. Have suggestion for an article: Most of the retractions/mega corrections lately seem to be due to image irregularities, especially on Pub Peer. There seems to be a script these authors follows which INVARIABLY states that the image problems don’t change the analysis or the conclusions of the paper…..if that is true then we should be seeing many of the retracted papers re-published with the same findings and different images…..Is this in fact really occurring? 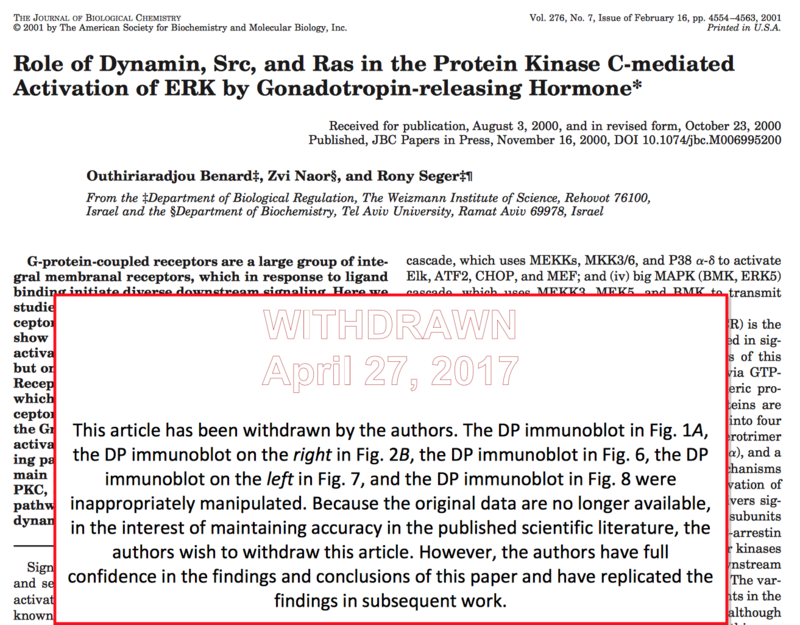 How do you treat coauthors of a retracted paper? Some of the authors of retracted papers have been very generous by inviting coauthors on their papers. The authors are a consortium behind an EU funded project. It would be useful to check if the funder are aware of the plagiarism. Another retraction for this group. Same reasons as before. (R Vrakking, G Verhaegh and PMJ Rosseel), the Journal Editor-in-Chief, Steve Yentis, and Blackwell Publishing Ltd.
New retraction from CEBP (hope I didn’t miss it in your archives or in other commenters’ comments). The first paragraphs of the retraction notice are provided below. ‘The article titled, “Confounding of the association between radiation exposure from CT scans and risk of leukemia and brain tumors by cancer susceptibility syndromes,” which was published in the January 2016 issue of Cancer Epidemiology, Biomarkers & Prevention (1), is being retracted at the request of the authors. Regarding your posting on 22. March “A big mistake:” Paper about the dangers of Wi-Fi pulled for plagiarism”, http://retractionwatch.com/2016/03/22/a-big-mistake-paper-about-the-dangers-of-wi-fi-pulled-for-plagiarism/: Your readers might be interested to know that the paper has been corrected and is now out again. See http://www.degruyter.com/downloadpdf/j/reveh.ahead-of-print/reveh-2016-0011/reveh-2016-0011.xml. Only formalities, not substance, have been corrected, as formalities only were behind the withdrawal. The scepticism – not to mention outright prejudice and suspicion thrown at the authors behind the paper – did indeed concern their findings, views and conclusions – but in their previous works and without any concrete evidence. It seems your site might function as a mocking stick were the mob or adversaries too easily might kling their enemies, and even get a hat tip for it. Any plans to discuss the case of Christian Kreipke? Lots of interesting stuff there, with only very recently a retraction, despite Kreipke already fired in 2012 for alleged misconduct. There are also several lawsuits related to Kreipke’s case. Any future plans to report on this paper and the 100’s of studies it will affect? Should all of those be retracted? Basically, the board states that the data that they have been able to review (though much raw data was missing due to poor laboratory practices and lack of compliance with established research protocols) in no way supports the conclusions in the article, thus concluding that the article constitutes research fraud. In addition, the board states that the rats were so emaciated that ethical considerations clearly should have lead the researchers to interrupt the experiment. There will be disciplinary actions from the K.I. towards the researchers (though the senior researcher (e.g. Macchiarini…) received the harshest criticism). The review board were asked to assess the article by the Karolinska Institute in May. As an alumna of the medical school at the Karolinska Institute (and someone who did research there for my PhD) I am saddened and embarrassed, though not entirely surprised, by the university’s administration and the way it has handled the whole sordid Macchiarini affair (which lead some commentators to call Karolinska “the Chernobyl of ethics”…). For some time i have been trying to raise an issue with scientists in physiology, about an apparent contradiction in a range of papers about the restriction of a particular tissue growth. So far i can find no one in the field or general physiology who is willing to comment on this. It is a basic rule in scientific studies, to take into account the recognised factors of influence in the field. Otherwise the study is not valid and can be misleading. In the case of studies into the restriction of tissue growth in-vivo, any recognised growth restricting factor must be taken into account. However in this particular area of study, one very basic growth restricting factor has been consistently overlooked. Hair follicles go through a cycle of regression and re-enlargement within the dermal tissue, and scientists seek to find the cause of the restricted growth of follicles in cases of hair loss. Yet there is no reference in any of the current studies to the resistance of the dermal tissue, and the recognised spatial growth controls. I suggest that once these controls are factored into the known data in the field, a lot of the mystery disappears. There are also wider implications to this connection in evolution, and some serious diseases. I discuss this in my article here. The current studies into hair follicle growth restriction, continue to ignore spatial growth controls. So if there is a scientific argument against a central role of spatial growth controls in hair follicle enlargement, i would be interested to hear it? 1. Das, Dilip Kumar, Mrinalini Bhagat, and Sangeeta Shree. “Agrobacterium Mediated Transformation of Vigna mungo (L.) Hepper with Cry1Ac Gene for Insect Resistance.” American Journal of Plant Sciences 7.02 (2016): 316. 2. Das, Dilip K., N. Shiva Prakash, and Neera Bhalla-Sarin. “An efficient regeneration system of black gram (Vigna mungo L.) through organogenesis.” Plant Science 134.2 (1998): 199-206. 3. Das, Dilip K., et al. “Improved method of regeneration of black gram (Vigna mungo L.) through liquid culture.” In Vitro Cellular & Developmental Biology-Plant 38.5 (2002): 456-459. 4. Das, D. K., and A. Rahman. “Expression of a rice chitinase gene enhances antifungal response in transgenic litchi (cv. Bedana).” Plant Cell, Tissue and Organ Culture (PCTOC) 109.2 (2012): 315-325. 5. Das, D. K., and A. Rahman. “Expression of a rice chitinase gene (ChiB) enhances antifungal response in transgenic litchi (cv. Bedana).” Current Trends in Biotechnology and Pharmacy 4.3 (2010): 820-833. A correction about undisclosed competing interests between Elizabeth Wager, the first author of a PeerJ paper, and Ana Marusic, the Academic Editor of this paper, was published on 14 September 2016. “This Correction makes clear the existence of links between the Academic Editor (A. Marusic) and the first-named author (E. Wager) that were not disclosed at the time of publication. A. Marusic has co-authored a 2013 article (Marusic A, Wager E, Utrobicic A, et al., 2013, http://onlinelibrary.wiley.com/doi/10.1002/14651858.MR000038/abstract ) with E. Wager and they subsequently worked together on the ensuing Cochrane systematic review. In addition, E. Wager has given unpaid workshops at the department of A Marusic, in Split, Croatia (where E. Wager is an unpaid Visiting Professor). Elizabeth Wager is listed as one of the members of the Board of Directors of the Center for Scientific Integrity, the parent organization of Retraction Watch ( http://retractionwatch.com/the-center-for-scientific-integrity/ ). The authors of this now retracted paper picked results from another paper and presented them as theirs. The retracted paper “Clc-2 knockout attenuated experimental temporal lobe epilepsy in mice by tonic inhibition mediated by GABAA receptors” by Yu-Xing Ge, , Xiang-Zhu Tian, published originally in Brain Research Bulletin, Vol 121, March 2016, Pages 209-214. A paper (plant science) in New Phytologist was retracted (oct, 6, 2016) after editorial request. The head director of the institute (ISA, Sophia-Antipolis, France) co-authored the paper. Don’t know if you are aware of recent 11 retractions from Tumor Biology. All from same institutions in Iran. All retracted for compromise of peer review and some additionally for plagiarism. Retraction Note to: Canine transmissible venereal tumor and seminoma: a cytohistopathology and chemotherapy study of tumors in the growth phase and during regression after chemotherapy. Javanbakht J, Pedram B, Taheriyan MR, Khadivar F, Hosseini SH, Abdi FS, Hosseini E, Moloudizargari M, Aghajanshakeri SH, Javaherypour S, Shafiee R, Bidi RE. Tumour Biol. 2016 Nov 5. Retraction Note to: Improving the diagnosis, treatment, and biology patterns of feline mammary intraepithelial lesions: a potential model for human breast masses with evidence from epidemiologic and cytohistopathologic studies. Manesh JY, Shafiee R, Pedram B, Malayeri HZ, Mohajer S, Ahmadi S, Ahmadi S, Javanbakht J, Mokarizadeh A, Khadivar F.
Retraction Note to: Diagnostic procedures for improving of the KIT (CD117) expressed allele burden for the liver metastases from uterus mast cell tumors: prognostic value of the metastatic pattern and tumor biology. Hosseini E, Pedram B, Bahrami AM, Touni SR, Malayeri HZ, Mokarizadeh A, Pourzaer M, Pourzaer M, Zehtabian S, Mohajer S, Ahmadi S.
Retraction Note to: Urinary parameters predictive and electrolyte disturbances of cisplatin-induced acute renal associated with cancer as a critical target of the chemotherapeutic agent in patients with solid tumors. Pedram B, Moghadam AT, Kamyabi-Moghaddam Z, Mavedati O, Beigi BA, Sharabiyani AK, Dezfuli AB, Khalili S, Bahrami AM, Nasoori A.
Retraction Note to: Expression and prognostic value of the aldehyde dehydrogenase 1 (ALDH1) and N-myc downstream regulated gene 2 (NDRG2) as potential markers in human astrocytomas. Goudarzi PK, Mehrabi F, Khoshnood RJ, Bagheri AB, Ahmadi K, Yahaghi E, Abdolhoseinpour H.
Retraction Note to: Tissue expression levels of miR-29b and miR-422a in children, adolescents, and young adults’ age groups and their association with prediction of poor prognosis in human osteosarcoma. Bahador R, Taheriazam A, Mirghasemi A, Torkaman A, Shakeri M, Yahaghi E, Goudarzi PK. Retraction Note to: Downregulation of miR-185 and upregulation of miR-218 expression may be potential diagnostic and prognostic biomarkers of human chondrosarcoma. Goudarzi PK, Taheriazam A, Asghari S, Jamshidi M, Shakeri M, Yahaghi E, Mirghasemi A.
Retraction Note to: Downregulation of microRNA-217 and microRNA-646 acts as potential predictor biomarkers in progression, metastasis, and unfavorable prognosis of human osteosarcoma. Azam AT, Bahador R, Hesarikia H, Shakeri M, Yeganeh A.
Retraction Note to: Downregulation of miR-148b as biomarker for early detection of hepatocellular carcinoma and may serve as a prognostic marker. Ziari K, Zarea M, Gity M, Fayyaz AF, Yahaghi E, Darian EK, Hashemian AM. Retraction Note to: Clinical significance and expression of the PRSS3 and Wiskott-Aldrich syndrome protein family verprolin-homologous protein 1 for the early detection of epithelial ovarian cancer. Azizmohammadi S, Safari A, Seifoleslami M, Rabati RG, Mohammadi M, Yahaghi H, Azizmohammadi S.
Retraction Note to: Evaluation of mRNA expression levels of IL-17A and IL-10 cytokines in cervical cancer. Akhavan S, Safari A, Azizmohammadi S, Azizmohammadi S, Aslami M, Yahaghi E, Seifoleslami M.
Retracted at the request of the Editor-in-Chief. almost ALL of professor Kuo’s papers are under scrutiny, and unfortunately multiple have been shown very obvious problems. 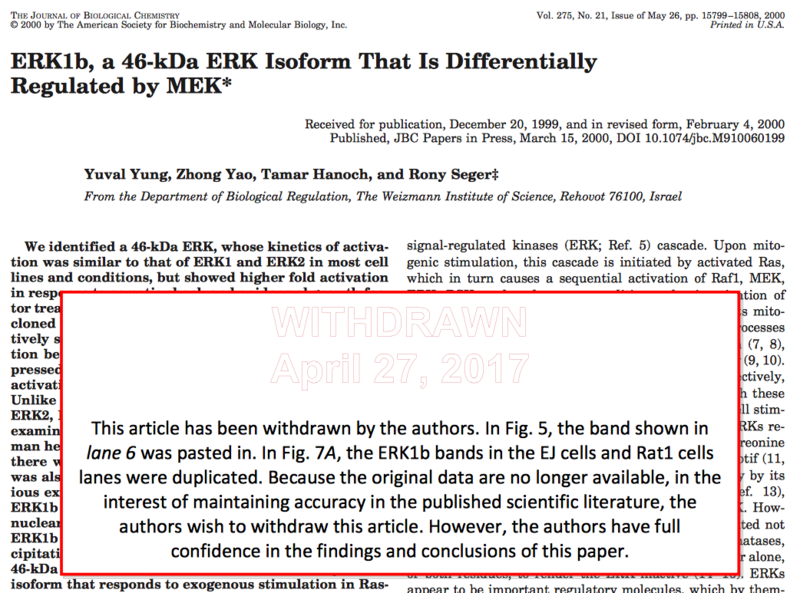 The paper from Nat Cell Bio (2016) has been retracted , according to the news, but not yet reflected on the journal’s website. Replication of text was identified in the Cochrane Review. This was limited to copying of short phrases and was acknowledged by the authors. The level of text plagiarism was minor and at a level that would be addressed by a correction. The Editor in Chief carried out further investigation into the alleged plagiarism of data, with the co-operation of the review authors, who provided supplementary information in support of their work. The allegations related to the derivation of means and standard deviations of data from some of the included studies. Although the authors acknowledge and cite the Hemilä 2011 review, the Editor in Chief considered that the authors’ explanation regarding some similarities in presented data between the two reviews was not conclusive. No comment at the journal itself, and indeed no trace of the upublished paper at all. Two of the three authors (Finelli and Tarantino) may be familiar to RW readers. Apparently the PIs were not aware of the submissions or did not give consent. The article was retracted by the authors who seem to have messed up some calculation and failed to give sufficient information as far as reproducibility of the experiments is concerned. The original paper had been cited 6 times according to Thomson Reuters Web of Science. This is interesting and shows the benefits to academics of publishing in predatory journals. The expense may be worth it if it helps you get or keep a better job. The retraction notice says the decision was made after the Rice University Research Integrity Officer reported misconduct to the journal. The misconduct is about manipulation of figures. The original paper had been cited 16 times according to Thomson Reuters Web of Science. It is interesting to note that the retraction notice says that one of the duplicated curves was found in an article (http://www.nature.com/nm/journal/v20/n7/full/nm.3484.html) published in 2014, i.e., two years after the publication year of the retracted paper (2012). Does the retraction also question the Nature Medicine paper? The other two are mentioned in the retraction notice. Anyone would feel bad about loosing four articles in a raw, I guess. But here, the retractions seem to follow from a discussion in the literature of the now retracted papers. As mentioned in the retraction notice, two other groups found that the results contradicted theory and experiments. The authors seem to have felt they had to have a closer look at their data. This presumably led them to find the mistake in their program. I would say they did the right thing with the retractions. I just hope the four papers were not the content of a PhD thesis, it would be sad. I am working in that precise field of research. In my opinion, this story is a warning for everyone who uses in-house computer programs: double checks, consistency checks etc. whatever you call them are not an option. If the results contradict a theory or experiments, you’d better compare them with another code before you send them for review. There are several of such codes available for free in the field of molecular simulations that would do the job. Two JBC retractions form the same group: Rony Seger, from Israel.. If I try and read through the lines here, it looks like the authors found out they submitted to a potential/possible predatory journal, tried to withdraw it, and then submitted it to a more credible journal. On the online version of Annals of Mathematics, one of the top 3 journals in pure math, there’s an odd “online first” notice, a retraction of a paper by the editors (something very rare, usually it is the authors who give a corrigendum) http://annals.math.princeton.edu/2017/186-1/p09 . What’s odd is that the editors give no explanation whatsoever, and a more minor point is that the retraction is dated july 1,2017 while we’re june 23. Research/publication ethics issue. Here is the question, do you feel that it is ethical to have to pay publication charges to an Open Access journal if you are submitting a “Letter to the Editor” to bring to light possible issues with a manuscript that are either unethical or a lack of methods that prohibits replication? Fashion journal takes down article after Vogue editor fired. Naude, C. E., Schoonees, A., Senekal, M., Young, T., Garner, P., & Volmink, J. (2014). Low carbohydrate versus isoenergetic balanced diets for reducing weight and cardiovascular risk: a systematic review and meta-analysis. PloS one, 9(7), e100652. Conspiracy theories aside, I’ve checked some of the stats myself, and at least two means and one standard deviation are incorrect in the meta-analysis. Given the simplicity of the flaw in the experimental set up, unavoidable questions about the quality of peer review come to mind. The transparency of the retraction process is commendable. Did you see this about Sato/Iwamoto? 5 more retractions for Dr Sato/Dr Iwamoto. Retraction note to: Strategy for prevention of hip fractures in patients with Parkinson’s disease. World J Orthop. 2017 Oct 18;8(10):814. I think Dr Sato now has 23 retractions, Dr Iwamoto 21, with 2 outstanding expressions of concerns. what happened on this paper retracted in Macromolecules? Risk factors for the prognosis of pediatric medulloblastoma: a retrospective analysis of 40 cases. Thanks for this. If you click through the links, you end up at this page, showing it’s for redundant publication (aka duplication). DeGeest, D. S., Follmer, E. H., Walter, S. L., & O’Boyle, E. H. 2017. The benefits of benefits: A dynamic approach to motivation-enhancing human resource practices and entrepreneurial survival. Journal of Management, 43: 2303-2332. After the initiation of an investigation into concerns about the reporting of results, the articles have been retracted as the result of information provided by corresponding author David S. DeGeest, who informed the journal that he incorrectly reported the results of the data analysis completed by him. Specifically, DeGeest notified the journal that many of the parameter estimates and significance tests he reported in the papers are false. DeGeest emphasized to the journal that he acted alone without the knowledge of co-authors. See Journal of Chromatography A, 1541 (2018) 63. My question to the journal would be: did IJP (or Elsevier, or someone else) perhaps use some image comparison software? It’s hard to see how they would otherwise have found this. My question to the authors would be: why on earth do something like this on a figure that is largely irrelevant? Heck, they could have used one of their own unpublished figures and misrepresent that (and I strongly urge others not to follow up on that unethical suggestion!). No one would have noticed. It also makes you wonder what else was possibly made up in this paper. There are 4 papers (only 1 peer reviewed) on PubPeer, and 2 self-published books, that need some attention from accomplished researchers, to check their extraordinary claims, concerning Darwin and Wallace. Knowledge in that area would be an advantage, but not compulsory. True grit is, however. Made-up scientist, pretending to be associated with the Karolinska Institute, publishes anti-vaccine article in international journal (Indian Journal of Medical Ethics). Authors rebranded homeopathy to “release-active” drugs and published more than 100 papers in peer-reviewed journals without mentioning the absence of active compounds in their “drugs”. Thanks for your work, Evgenia. Highly appreciated someone is willing to put in so much effort to get bad science flagged. The scientific community (that includes me) should do this more often. Authored by Kim Kardashian, Satoshi Nakamoto, and Tomas Pluskal. The paper is complete and total gibberish, and likely created with some generator. I only found it because I got an invitation from the journal, and noticed the weird title of this paper and the author list. If the “Lupine” name is the first of a series of predator-themed publisher names, I applaud the nascent tradition, and suggest ‘Vulpine’, “Musteline” and ‘Crocutine’ as future possibilities. “Lupine” claims to be US-based, with a mail-forwarding-service address in New York. It shares this, its phone numbers, and many details of domain registration with “Crimson Publishers” and “BioMedical Journal”. I should have mentioned this in my previous post, that the editor(s) of this journal should be commended for the quality of the retraction notice. After reading the notice, there is absolutely no doubt as to the detailed circumstances leading to the retraction, what rules were broken, etc. This group of authors got another paper flagged on Pubpeer, days after their 1st retraction. I have just came across this notice of retraction in Drug Metab Disp. At the request of the primary author and investigator, and in consultation with Drug Metabolism and Disposition, this paper has been retracted. Upon further investigation of the results, the laboratory is unable to reproduce results that are primary to the paper, and are unable to contact the scientist that generated the results. Thanks, this one is already in our database. But you already reported in 2015 (https://retractionwatch.com/2015/08/18/exactly-the-same-clinical-study-published-six-times/) that it was retracted, with the same retraction notice as published in the latest issue. Why did it take three years to officially publish the retraction notice? The vice Minister of Education (Ministry of Education, Youth and Sports) of Albania, Mr. Ervin Demo, ex-vice/Rector of University of Tirana has allegedly plagiarized two of his latest papers. 7 retractions for Sharma and Madhuri all in RSC journals. How many in total is that now – 20? *21 (7 plus these https://www.chemistryworld.com/news/indian-institute-investigates-nanoscientists-for-indiscriminate-image-manipulation-/3009159.article), which would make Rashmi Madhuri the first woman on your leaderboard. This page and it following pages show IEEEE conference papers for a conference where an unusually large proportion of papers were retracted. What went wrong? You note that Dr. Fujii’s paper, “Prevention of vomiting after tonsillectomy in children: Granisetron versus ramosetron” was retracted, but your search tool includes the “expression of concern” (DOI: 10.1002/lary.26260) in the retraction column. The DOI for the retraction is (10.1002/lary.26509). Paper number 1-5 were Retracted because of Fake peer review, while paper number 6-7 were Retracted because of Plagiarism. A review on cannabis and mental health had a correction issued because the authors wanted to make it open access (https://doi.org/10.1007/s00406-019-00999-x). The correction notice is open access, but the original article still is not (https://doi.org/10.1007/s00406-019-00984-4). It just sends you back and forth between a paywall and a correction saying there isn’t a paywall anymore.